Wolf Spiders are members of the family Lycosidae. 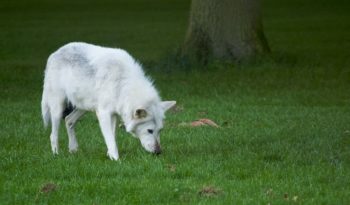 They are so named because their method of hunting is to run down their prey like that of a wolf. Wolf Spiders are robust and agile hunters that rely on good eyesight to hunt, typically at night. Wolf Spiders resemble nursery web spiders (family Pisauridae), however, they carry their egg sacs by attaching them to their spinnerets (instead of by means of their jaws and pedipalps). Wolf Spiders range from about half an inch to 2 inches in length. They are hairy and typically brown to grey in colour with a distinct Union Jack impression on their backs. The spiders undersides are light grey, cream or black, sometimes salmon pink. Wolf Spiders have eight eyes arranged in three rows. The bottom row consists of four small eyes, the middle row has two very large eyes and the top row has two medium-sized eyes. Wolf Spiders depend on their good eyesight to hunt. Their sense of touch is also acute. The sides of their jaws may have a small raised orange spot or ‘boss’. Because they depend on camouflage for protection, Wolf Spiders do not have the flashy appearance of some other kinds of spiders. In general their colouration is appropriate to their favoured habitat. Wolf Spiders eyes reflect light well and one way of finding them is to hunt at night using a flashlight strapped to ones forehead so that the light from the light is reflected from their eyes directly back toward its source. Wolf spiders can be found in a wide range of habitats both coastal and inland. These include shrub lands, woodland, wet coastal forest, alpine meadows and suburban gardens. 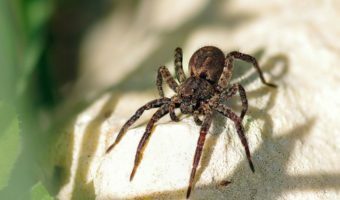 Wolf spiders are commonly known as household pests as when the weather starts getting colder, they look for warm places to overwinter in homes. Wolf Spiders are commonly found around doors, windows, house plants, basements, garages and in almost all terrestrial habitats. Wolf Spiders do not spin a web, instead, they roam at night to hunt for food. 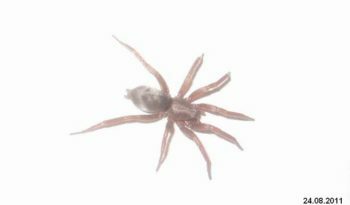 Wolf spiders are often confused with the Brown Recluse spider, however, they lack the violin-shaped marking of the Recluse. The wolf spider is shy and is most likely to run away when disturbed. Two Wolf spider species are known to be predators of cane toads. Lycosa lapidosa will take small toads and frogs while Lycosa obscuroides has been noted biting and killing a large toad within one hour. Mating takes place outside the females burrow at night. Some adult male Wolf spiders of smaller-sized species are known to disperse by air in order to find mates. The male is attracted by scent markings left by the female, often associated with her drag-line silk. Males perform a courtship ritual prior to mating, often involving complex leg and palp signaling to the female. The female Wolf spider constructs an egg sac of white papery silk, shaped like a ball with an obvious circular seam, which she then carries around attached with strong silk to her spinnerets. When the spiderlings hatch, they are carried around on the females back until they are ready to disperse by ballooning or on the ground. Such a high degree of parental care is relatively unusual among spiders. Wolf spiders live for up to 2 years. The Wolf Spider is not aggressive, however, it will inject venom freely if continually provoked. 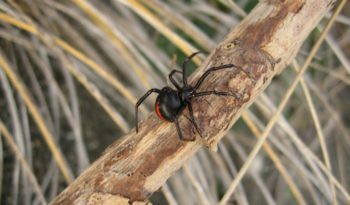 Symptoms of its venomous bite include swelling, mild pain and itching. Though usually considered harmless to humans, its bite may be painful.